Every precaution will be taken to protect the artwork. However, InFocus and the Tuolumne County Arts Alliance (TCAA) will not be responsible for loss or damage to art entered in the show. All works must be for sale. A 35% gallery commission applies. Members of TCA will not be charged a commission. Artists must be a member of TCA before the competition begins to take advantage of the waiver of the gallery commission. You can sign up the day your bring your photos into Angelo's Hall! Accepted works must be submitted in framed or finished condition. Canvas wraps and metal prints are accepted and are not required to be placed in frames. Canvas and metal prints wires needed or permission from InFocus committee. Styrofoam or alligator hanging systems on metal prints are not acceptable. Plastic or “fast” frames are not acceptable. The maximum width of an image is 36 inches measured on the outside edge of the frame. The maximum overall framed size is 60 inches, which is determined by adding the outside-framed height, plus the outside framed width together. For example, a 16"x20" frame might measure 19"x23" when measured from outside edge to outside edge. Add 19"+23" to determine the overall framed size which, in this example, is 42". Photos may not weigh more than 12 lbs. Photos must have picture-hanging wire firmly attached across the back. Sharp wire ends must be taped. 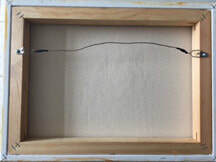 Wires must be taut and placed between 1/3 and 1/4 the height of the frame from the top of the frame. No saw tooth hangers will be accepted. Works that have been selected for the show must be picked up on Sunday, March 24, 2019 at Angelos Hall between 3:00 p.m. and 5:30 p.m. or by arrangement. Bring your receipt to claim your photos. Photos that are not picked up during these hours will be taken to the Tuolumne County Arts Alliance offices and may be picked up there by arrangement. A storage fee will be charged for photos that are not picked up within 14 days.